Time to celebrate this week with Ruth Ayers. First the books. I bought a bunch of books. My presents for my students and me. I get to read them first. Next week they go into the book lottery. 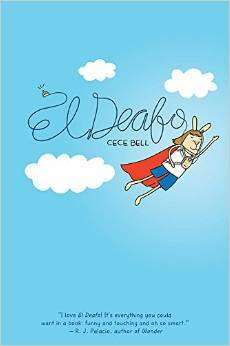 True confession: El Deafo by Cece Bell is the first graphic novel I have read and loved. Sorry all that came before. Maybe it was the bigger font. Maybe it was the fact that there were more “girly” images. Or maybe it was an easier read. I have to admit the more aggressive graphic novels were hard for me. Hard to follow. Made my eyes kind of spin. 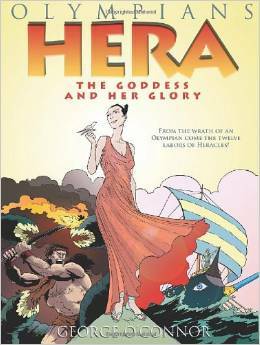 After reading El Deafo though reading Hera by George O’Connor was much easier. Hmm. My readers who struggle with words placed traditionally in text can thrive and comprehend in the graphic novel world. A world I am just starting to learn. A place my strugglers thrive, I struggle. Time for them to start teaching me a thing or two. 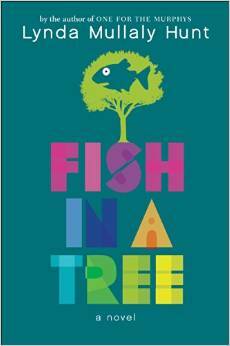 I believe Fish in a Tree should be required reading for all teachers. I saw Lynda Mullaly Hunt at NCTE and was fortunate enough to get this book there. Ally’s struggle is mirrored in the lives of so many of my students. The way Mr. Daniels pulls her out and sees Ally is beautiful. Hunt articulates the struggle perfectly, simply. So that we teachers can understand in our core. 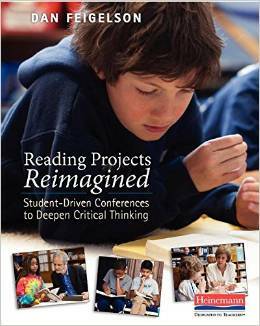 In my professional stack is Dan Feigelsons’ Reading Projects Reimagined. 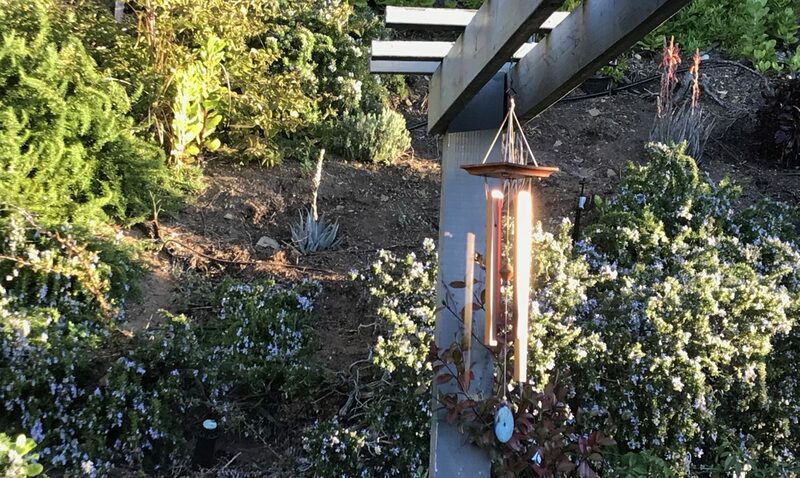 I’m just starting on these “projects” with students and blogged about it here. Magic words in this book, “say more about that” are worth repeating again and again and again so we teachers can start to hear what our students are thinking. I want to celebrate kindness and trust. 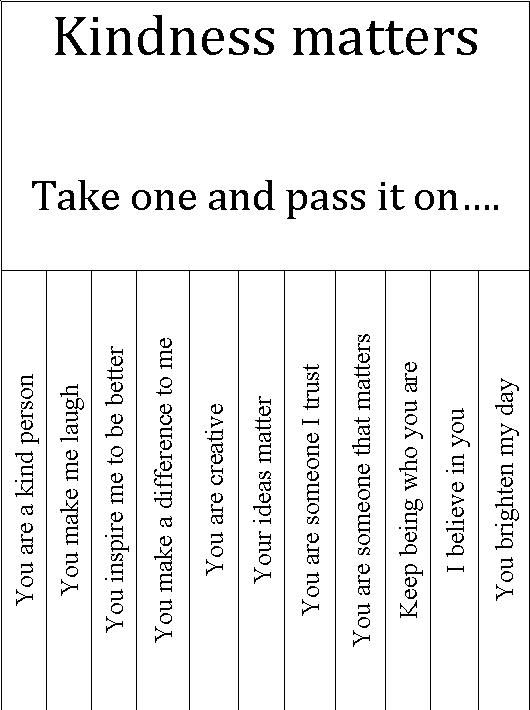 My students have been sharing this Kindness matters tear off. I found it on Pernille Ripp’s blog. We have been learning what kindness looks like day to day. 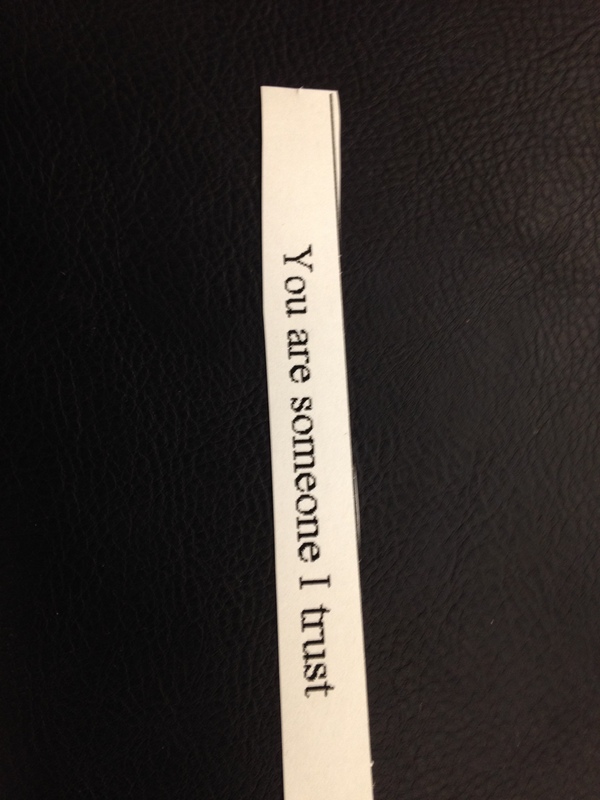 A student gave me this. I was so surprised and pleased. Kindness matters. I couldn’t ask for more. I have heard so many wonderful things about Fish in a Tree. I can’t wait to read it myself. The ending of your post just warmed me up. I had a student “protect” me this week. Actually another student said something not so kind, and this student took up for me. It is great to see that we make a different in their lives and they actually do care about us. Have a great week! That is so beautiful! I love that a student gave you that gem. I wrote about Feigelson’s new book this week, too! It’s full of valuable information. FIAT is amazing. I loved hearing from Lynda at NCTE. I could listen to her speak for a long time. El Deafo was a turning point for me with graphic novels too. I was a luke warm fan before. Then I went on to read Smile, Sisters etc and became quite delighted with the genre. Hope you find some other titles you like. I’m hearing so much about Fish In A Tree-can’t wait. Thanks for sharing the kindness tear off at the end. Fun idea. And glad you received a special one! Thrilled when Tara and I got a copy of Fish in a Tree (read it on my plane trip home), but sad that we missed meeting Linda Mulally Hunt. I was so excited when she commented on my One for the Murphys blog post. I’m also not a fan of graphic novels, so maybe I should request El Deafo.